Jake Sullivan ’20 (center) and fellow SWAGLY HEARRT peer leader Erica Gilman meet with Lamar Brown, community relations manager and adult supervisor for the SWAGLY program at AIDS Project Worcester. Jake Sullivan ’20 possesses a sense of self-awareness that motivates him personally, inspires him academically, and is helping him shape his professional future. 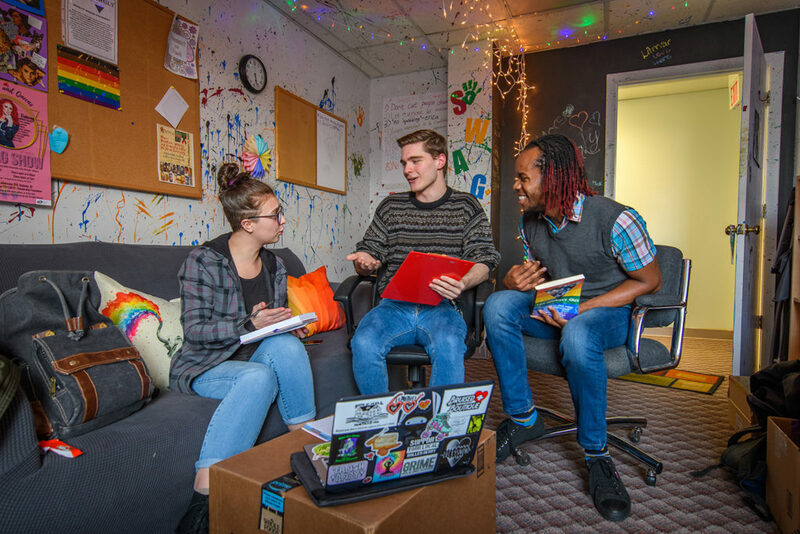 A psychology major with a minor in community, youth, and education studies, Sullivan is committed to serving the LGBTQIA+ community, both at Clark and in Worcester. Sullivan works at AIDS Project Worcester, which gives him the opportunity to learn about youth work and the city’s LGBTQIA+ community. What began as an internship has turned into a job offer to become a peer leader for SWAGLY (Supporters of Worcester Area LGBTQIA+ Youth) HEARRT (Health Education and Risk Reduction Team). Sullivan is working with his faculty adviser, psychology Professor Abbie Goldberg, in her Diverse Families and Sexualities research lab. Goldberg studies gay, lesbian, and heterosexual couples who have built their families through adoption, and is conducting a second study that deals with transgender and gender-nonconforming students’ experiences with their colleges. Next year, Sullivan will complete his honors thesis on how social media has influenced the development of queer identities in youth, and how one’s offline and online expressions of queerness align and differ. He notes that people are struggling to reconcile their sense of self amid the various influences and stresses they receive through online networks. After graduating from Clark next spring, Sullivan plans to either pursue a master’s degree in community development and planning through Clark’s Accelerated B.A./Master’s Program, or seek a master’s degree in social work elsewhere. No matter what path Sullivan chooses, Clark has given him the knowledge and confidence to make the most of all of the experiences presented to him.